Bundled up against the cold, Janet Perez walked down Willis Avenue in the Mott Haven section of the Bronx this month, politely approaching parents waiting for their children after school. She smiled and spoke softly, all too aware of the heightened fear in this predominantly Mexican neighborhood: Rumors of immigration raids had set people’s nerves on edge after the authorities in other cities began deporting women and children who had lost asylum cases. To clear up the confusion, Ms. Perez was inviting those who were worried to a community meeting. Ms. Perez can relate to that fear. Her parents brought her to New York City from Mexico when she was 6 months old, and she grew up as an undocumented immigrant. Now 24, she had come of age navigating the obstacles facing young people like herself, and in recent years had been able to get a work permit and to avoid deportation because of a federal policy put into effect in 2012. Yet even before that, she had already decided she had to speak out. To some extent, it is a measure of the Mexican community’s growth and political maturation that young people like Ms. Perez are stepping forward in a way that their parents could not. 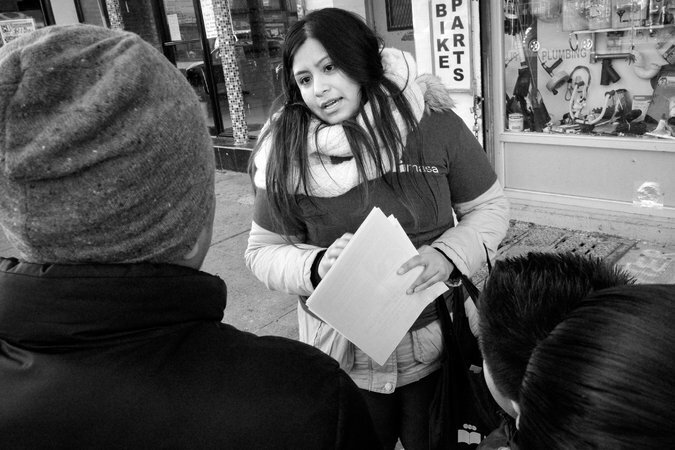 Guided by the experiences of past immigrant groups — and aware of how their own experiences are different — they want to use their voices and skills to move their community forward at a time when politicians like Donald J. Trump have demonized it. Read the rest of this article in the New York Times.